& from Belgium / België / Belgique including Rendeux. Buy a pack of 9 and save £22 against the cost of a regular triple pack today - this offer is exclusive to our site! Our unique Play & Display Flip Framegives you the chance to stylishly display your favourite vinyl albums or 12" singles and their contents on your wall. With this record frame’s unique design, you can also change over your display within seconds, without having to remove the frame from the wall. The Flip Frame has a unique quick release system; simply press the catch at the top and they hinge open. We understand that no two records are alike; with this in mind our Flip Frames are specially designed and manufactured to compensate for differences in the thickness of LP or 12" records when displayed in the frame. This is achieved thanks to the unique ‘sponge finger’ system on the back of the Flip Frame, which ensures that any 12" record will fit comfortably and securely inside. *NEW* The Flip Frames UV protected crystal clear front window brings out every detail of your favourite album artwork, while protecting your precious vinyl from sunlight, dust and with the back plate of the frame, soft pads at each corner ensure that the frame sits neatly against your wall. Play & Display Flip Frames come fully assembled and beautifully packaged, ready to attach to your wall with just one screw (fixture included in the box). Available in neutral black and stunning white, Play & Display Flip Frames come fully assembled and beautifully packaged ready to use. Simply enter the words "art vinyl" into the search box, hit 'GO' and discover other Play & Display purchase options. Buy 3 frames and save £18 against the cost of a single frame! 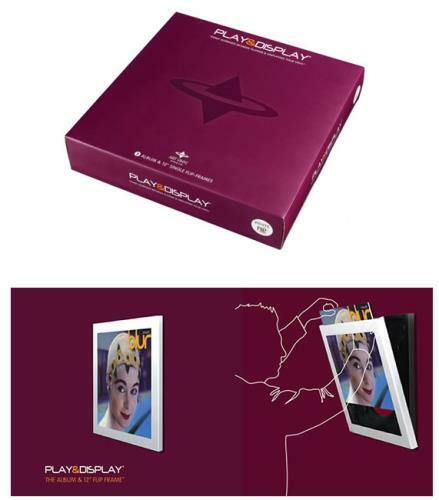 Product Information Art Vinyl/Artvinyl Play & Display Album Flip Frame White Play & Display Album & 12” Flip Frame -Pack of 9 UK Art Vinyl P&D Frame.